This sequence of illustrations is intended to provide surgical residents with an overview of a quadruple coronary bypass graft procedure. 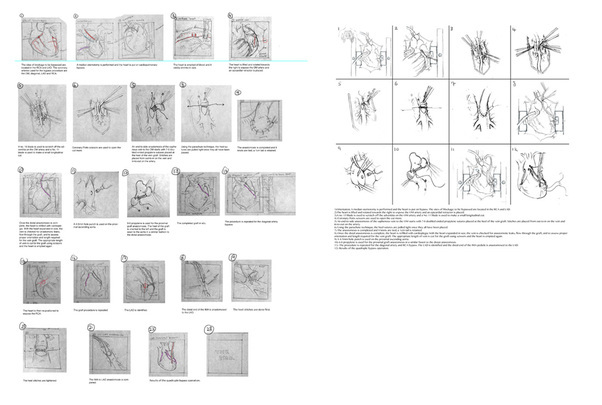 Goals of this project were to develop skills essential to surgical illustration. These include OR observation and documentation, learning about surgical techniques and tools, story telling, technical accuracy in anatomical accuracy, tonal rendering and layout. These were very quick and rough sketches done during the OR observation of two quadruple coronary bypass graft procedures. The goal was to capture the main steps, establish context, and write down as much information as possible. From the OR sketches, I created a series of thumbnail sketches describing the surgical procedure. After revising them and working out the figure captions, I narrowed the number of thumbnails to 12. When the thumbnails were finalized, I redid each thumbnail step so that they were large, clean, detailed line drawings I could use as a base for rendering. After the thumbnails were decided I started to experiment with the layout. The challenges were trying to include flow, visual focus, text, and maximize clarity. These were a series of small studies I did before rendering the final piece. I wanted to see what style I wanted to use and how to translate color into tone. These are rendering studies I did for the final piece. Here I was experimenting with various ranges of tone, shadows, and sizes of each thumbnail. *The final layout was then changed for the AMI 2014 Salon. Baumgartner WA, Stuart RS, Gott VL, and Schlossberg L (2000). Harlan BJ, Starr A, Harwin FM (1996).